We know a lot about the power of love, too. 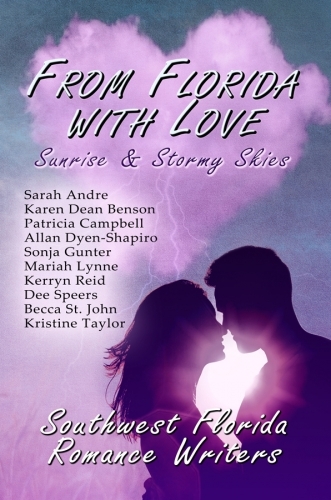 We know love can survive storms of all kinds, and these ten new stories from Southwest Florida Romance Writers prove it. Here, love comes to rich and poor, young and old. It lurks on the beach, in town, and in Florida’s agricultural heartland. It might creep up on you, or it might strike with the power of a hurricane. Sometimes the hurricane arrives in disguise: a vintage motorcycle, a bucking bronco, a man’s name. Be surprised, be moved, be open to what comes after the storm. Because sometimes, out of devastation, come new beginnings. And the heart of each story is love. A probie firefighter surfs the post-hurricane waves to distract himself from the trauma of not being able to save his first victim. 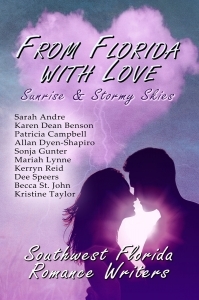 Among the tumultuous waves he meets a glamorous ER physician who things he’s a ‘playa’ until he saves her life. In return, she saves him from his psychological crossroads. Blustering tropical wind coming off the Gulf, whipped Rick Cane as he cut the engine of his Jeep. He stared dully at the turbulent, blue-gray waves crashing ashore. The roar and hiss of each ebb and flow was oddly soothing, and he leaned back against the headrest. His muscles were heavy weights, yet still vibrated with adrenalin, as if his body didn’t know whether to fall face-first onto the asphalt or kick into a three-mile sprint. He should be home sleeping like Chief Staunton ordered, but every time he closed his eyes, her bloody, panicked face appeared so sleeping was out of the question. If only he could get so plastered, he’d pass out, but he only had a twelve-hour reprieve so shots of whiskey wouldn’t work. Driving to the beach seemed like the only relaxing option left, so here he sat, eyelids like ten-ton weights over gritty, dried-out eyes. However, even being lulled by the post-storm waves didn’t stop him from wondering if he could have saved her. he should have saved her. It’s why he became a firefighter.